We are narrowing down our current Alternative Tool Use series to a delicious end. We’ve had some fun talking about unusual ways to use tools for lifehacks and workhacks. Some of these have been helpful tidbits (the utility knife and drill lifehack, for example) while others could really save a job from going sideways (the wood screw lifehack). Because a little ingenuity can help spark creativity in other areas, we regularly consume hacks and tips even if they seem odd or silly. Today’s hack isn’t so much a new twist, but it is an alternative use for the band saw that will be especially useful to our hunting and farming friends. The band saw is one of the shop’s or mill’s most prized possessions. It’s used to accomplish the rough work of re-sawing big lumber to the finest and most intricate work in small pieces. The continuous, one-direction blade motion creates a smooth and quiet cut. To the woodworking purist, it can be therapeutic to watch the lines begin to take shape in the wood. But the band saw is also used in butchery – and has been for a long time – to create those cuts of meat that we pick up wrapped so nicely in the store. We hope it goes without saying that you won’t use the same saw that you used to cut out some corbels yesterday to process the game you shot today. If you’re going to get into processing yourself, you’ll want a saw made specifically for such a purpose rather than your standard shop model. There are some major health concerns that come up with non-food grade materials and cleaning. Be sure to seek out people – online or otherwise – who’ve done it before, too. Some guys find that using a saw (instead of a knife) for venison in particular negatively impacts the taste as it releases marrow into the meat. 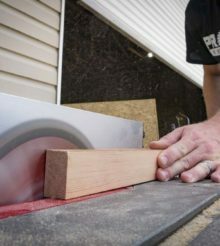 We hope you’ve found this band saw tip interesting and helpful! Don’t hesitate to have us over for dinner after leaving your band saw tips in the comments below —or contact us with your own Pro tips.